Following a failed move of the production plant by Cardiac Science, supply of one of the best known defibrillators in the market was seriously interrupted . 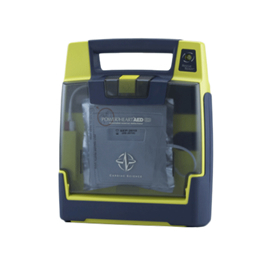 The fully automatic Powerheart AED G3 has been unavailable for the last three to four months. Luckily, production has resumed again and the first units are back in the market. Safelincs has been supplied with a significant number of the units to allow us to satisfy customer demand. The G3 Plus has a 7 year warranty, a minimum 4 year battery life and a 2 year life of the defibrillator pads. Due to these features, it is one of the most popular units in the marketplace. Schools, offices and sports clubs are among the main users of these portable defibrillators. Children’s defib pads are also available for these AEDs. Ensuring that unwanted persons are kept out of your building without jeopardising a rapid fire escape from the inside of the building can be difficult. Panic bars are really only suitable for additional fire exits rather than the main entry points of a building. Magnetic locks (also called maglocks or mag locks) can offer here a solution. Magnetic locks use a strong, electrically powered electromagnet to hold the door closed. If the power fails, or is interrupted by a fire alarm signal, the magnet loses power and releases the door which can then be opened. The door can usually only be released by pressing a button on the INSIDE of the building, although external keypad overrides are available. We have launched a range of magnetic access control kits from Deedlock that not only keep out uninvited guests, but also link-up with fire detection units to release doors in the event of a fire. These kits are ready to be installed by any electrician. Magnetic door lock kits can include the following release methods: key fobs and card reader units, release switches, digital keypads and emergency break-glass units. And of course the maglocks can be released automatically by a fire alarm system in case of fire. The maglock devices are powered by a 12V power supply. 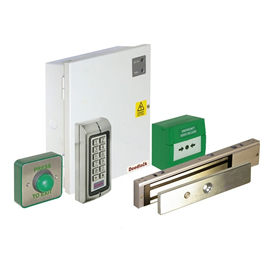 For a range of other access door control equipment take a look at our exit door security range. International fire safety customers are always welcome at Safelincs and to show how much we value them, we have just made the international enquiry process even easier. Whether you are looking at importing smoke alarms, escape ladders or evacuation hoods, our new system will enable you to make a quick enquiry for any of our 3500 different fire safety products. At the top of each page and on each product page there are links to the contact form for you to fill in, which will be sent directly to our international team to deal with. Safelincs has many years experience when it comes to exporting fire safety products such as extinguishers, and we are exporting to over 100 countries worldwide. Our staff are trained and certified to package and send dangerous goods by road and sea freight. Coupled with this we work with several reliable carriers and freight companies, ensuring that we secure the best price and transport method to get your goods to you. We are happy to quote for one item or for bulk orders. 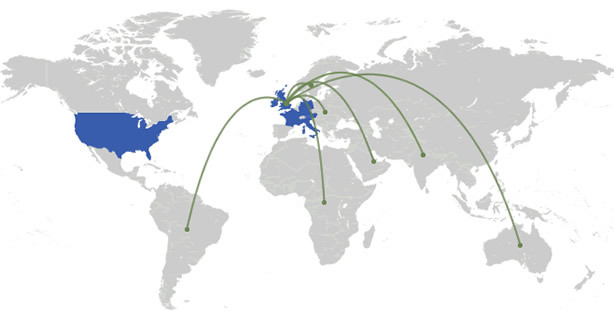 Our export orders are sent with all the necessary export documentation and can include Certificates of Origin. To make an international enquiry, please complete our International Enquiry Form. A fire at the recently opened Rhodes @ The Dome restaurant in Plymouth closed the restaurant for the evening. But, to paraphrase an old saying, the smoke cloud had a silver lining. The fire extinguishers staff used to extinguish the fire were purchased from Safelincs so they were replaced free of charge. Customers who purchase fire safety equipment from Safelincs will have them replaced for free if they were located near, or used on a fire. In fact, the restaurant benefited from the very latest in fire safety technology as Safelincs replaced them with water mist extinguishers of the type that are receiving considerable interest from the hotel and catering industry at the moment. The £1.5million restaurant is the latest project from celebrity chef Gary Rhodes and opened in January this year. The fire started just after 6.30 on a Friday evening in a commercial cooking range. Safelincs’ ‘Dry’ Water Mist Fire Extinguisher will put out just about any type of fire, including deep fat fryer fires, without leaving harmful residues. Its supersonic nozzle disperses microscopic ‘dry’ water mist particles to suppress fires and extinguish burning materials quickly and easily. Smoke is minimised and the user is protected from the heat by the cloud of mist. There are no nasty chemicals to clear up and the extinguisher will not ruin any food that is in the vicinity. Dry water mist is also safe to use on electrical fires. In all, five extinguishers were used and each has been replaced, free of charge, by an engineer from Safelincs. Guests present on the night of the fire complimented the staff who calmly ushered them outside while they waited for the fire to be dealt with. After the situation was under control they were able to return to the bar where they were offered a glass of Prosecco but the patrons had to wait for another night to sample the food.